The Alvis Owner Club will be exhibiting at the 2018 NEC Birmingham Lancaster Insurance Classic Car Show in Hall 1, Stand 525 from Friday 9 – Sunday 11 November 2018. Of the few memorable cars of the early 1950s, the Alvis Grey Lady was something special, retaining pre-war styling with 100mph performance. Two of the five AOC exhibits at the NEC date from 1936 and 1937. Firebird Cross & Ellis tourer – the 1936 Glasgow Motor Show exhibit. Of 450 Firebirds, 25 were made with this coachwork and 13 are believed to have survived. This 1937 Speed 25 Charlesworth saloon has stayed in one family from new and has 91,000 miles on the clock. The oldest of the five exhibits at the NEC ….. The themes for 2017 are Family ties and Innovation. Although Alvis are frequently kept in the family for decades, the fact that all (well, nearly all, read on) Alvis cars are at least fifty years old it is tricky finding owners willing to display their cars. However, we have secured an excellent example that has been in the Wiggins family since the 1930s – a 12/70 saloon. The other four exhibits represent innovation, with the 1920s front wheel drive, the 1930s Speed models with ifs and all synchro boxes, the 1950s with a Willowbrook 3-litre and the 2010s with the Continuation 4.3. 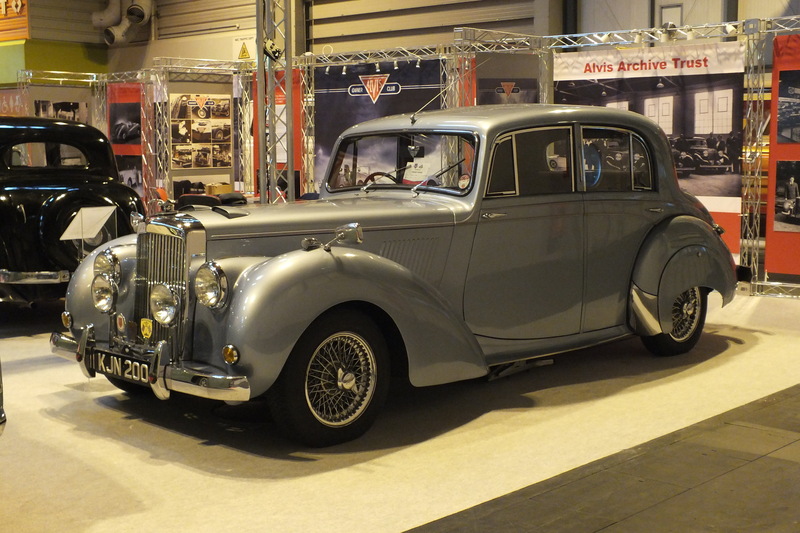 For the first time we manned a corner of the Alvis Owner Club stand in Hall 20 at the NEC. The theme this year was “Specials” and some fine examples of the special builder’s art were on show. Two of the current owners had built their cars but a pleasant surprise on Friday was a visitor to the AAT table who built another of the cars on the stand. He was Derek Baker who had worked for Peerless, Gordon Keeble and Key West and had built the Burns Special. The signage meant you could not miss your target. Alongside the AOC stand was the Fisher Restoration stand which had three fine examples of Alvis including Bill Rankin’s 4.3 short chassis tourer ALV 15. Coventry Transport Museum showed a red TB14 in unrestored condition. The Midland Automobile Club showed Alan Stote’s TF21 Graber coupe as it won their Concours this year. 1929 Supercharged 4 cylinder Front Wheeled Drive Car No. 12064 Ch. No. 7275 Engine No. 7675 Reg: WK8047. First registered Jan 1929, to a Mr. R. Cecil in London. Uniquely fitted from new with Smiths auto searchlight type C270, extra long range fuel tank and non standard racing instruments; including Brooklands calibration tag. Poignantly as this picture was taken on Remembrance day, its last pre war owner, a Royal Naval Officer, placed the car in storage but never returned for it. The car was barn stored until the 1960s when it was restored and is considered to be one of the most original FWD cars. The Club’s 2011 stand in Hall 5 fronted by Vic Allen’s 1927 12/50 TG Cross and Ellis Narrow Sports shown in its original colour scheme of green & grey.